CINCINNATI, OH (August 13, 2016) – The Cincinnati Zoo & Botanical Garden would like to express its gratitude to Hamilton County residents for their continued support with a much-deserved “Thank You!” Zoo visitors of all ages can enjoy half-price admission during Visitor Appreciation Days, presented by FirstEnergy Solutions, August 20 & 21. Spend one of the final weekends of summer enjoying the best of the Zoo’s summer lineup with animal shows, special animal encounters and feedings. Other must-see recommendations include the new Hippo Cove exhibit, Cora the baby giraffe, the African lion family, polar bears, meerkats and more! 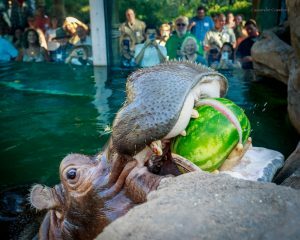 Zoo guests continue to play a fundamental role in maintaining the Cincinnati Zoo’s status as a world-class organization. The Zoo has been rated the #1 attraction in Cincinnati and is consistently recognized as one of the top Zoos in the nation. See what YOUR Zoo has to offer and take advantage of 50% savings August 20 & 21.